Media coverage on Charlotte’s proposed LGBT-inclusive non-discrimination ordinances continues to come fast and heavy, as opposition to the ordinance increases from conservative and religious leaders. The onslaught of misinformation from the right is getting a boost from local outlets like WSOC — which I’ve come to dub We Stigmatize Oppressed Communities, based on their demonstrated, repeated insistence for inaccuracy and sensationalism — and, now, from Charlotte’s local Fox affiliate. Since Feb. 9, WSOC has consistently aired factual inaccuracies about the ordinance changes, allowed mistruths and spin from one side — those opposed — to go unchallenged or without fact check, and relied on transphobic stereotypes and bias to push their coverage to viewers. Several updates and a complete run down of some of We Stigmatize Oppressed Communities’ original inaccuracies and biased coverage is here. Find an archive of all updates here. We Stigmatize Oppressed Communities continued their trend of bias and inaccuracy on Tuesday. And this is despite every effort in the world by those in favor of the ordinance to provide fact sheets, tips, guidance and alternate views. On Tuesday morning, WSOC reporter Mark Becker called me for an interview. I declined his interview, personally unwilling to lend my face and voice to biased and inaccurate coverage that hurts the LGBT community. The station’s past reporting and their absolute intransigence in retracting their factually inaccurate reports gave me no hope, promise or trust that their coverage would be fair. Instead, I offered to speak with them on background, if necessary, and offered Becker via email the press kit compiled by the Charlotte Non-Discrimination Ordinance Coalition. WSOC already has this press kit, as do other local stations. Becker had it before he began his reporting. He and the station ignored it. 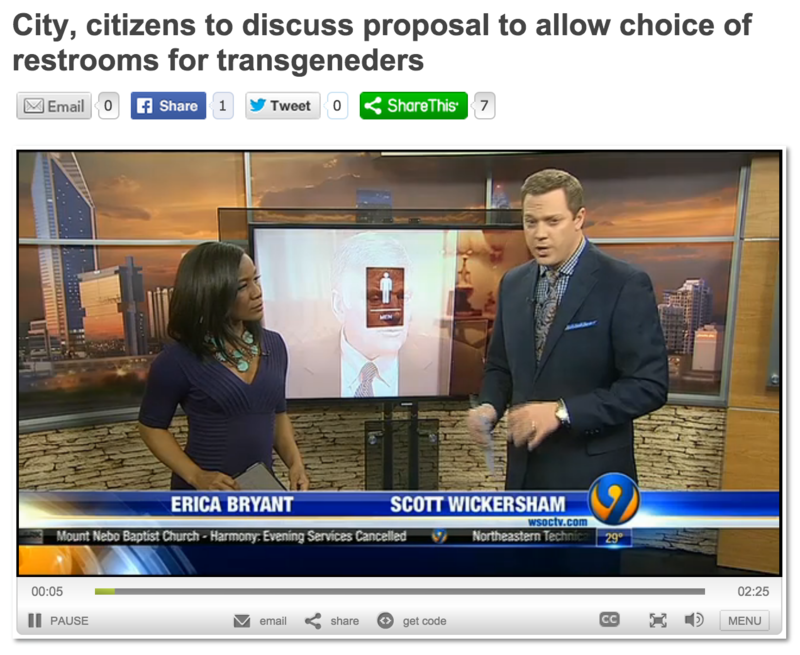 Contained in the press kit are several quick facts about the ordinances, a longer frequently asked questions document and, more importantly, contained within the Charlotte city attorney’s memo on the ordinances, a document which reveals that in more than a dozen states where similar laws exist, local police have found absolutely no problems related to transgender people and sexual predation. What’s missing from Becker’s and WSOC’s report? Any fact checking at all. They just drop Graham’s quote like it’s God’s-honest truth, despite reams of evidence from states across the country against the contrary. No mention of those facts, only opinion from a religious leader with a demonstrated bias and hostile animosity toward LGBT people. With each passing day and each passing segment on LGBT people, We Stigmatize Oppressed Communities becomes increasingly deserving of their newly minted call letters-inspired nickname. WSOC is no longer alone in its determined quest to gin up fear and misinform the public. On Tuesday morning, local Fox affiliate WJZY My Fox Carolinas 46 aired what it called a “debate” between a proponent of the ordinance changes and an opponent. In reality, it wasn’t a debate. It was a rhetorical slaughter. That’s because WJZY chose to pit Nami, an untrained, average citizen with no experience in LGBT advocacy (that I’m aware of) against Frank Turek, a well-known, well-trained, well-practiced and highly-educated Christian debater, apologist and evangelist who’s spent a great bulk of his recent career engaged in highly publicized advocacy against LGBT people and non-Christians of all stripes. To be clear: None of this is the fault of Nami, the transgender man the station booked to participate in the interview. He shared some great personal stories and did as best he could. But it was clear Nami was in way over his head. What the station did hear wasn’t fair to either of the debate participants, and particularly harmful to Nami and the side he was brought on to represent. WJZY’s news director, Kim Agle, had called me on Monday, explaining the segment and asking for possible debate participants. I connected her with leaders from the Charlotte Non-Discrimination Ordinance Coalition. I don’t know the reasons why no one from the Coalition was able to join WJZY, but what I do know is that the station bears a great responsibility in how it treats its interview subjects and other participants in its coverage. I don’t know Nami and I don’t know his background, but looking at the cringeworthy debate it’s clear to see he wasn’t the right fit against Turek, who overtalked Nami and host Page Crawford with a slew of inaccuracies and mistruths, all of which neither Nami nor Crawford were prepared to counter with real facts. And, both Nami and Crawford become clearly flustered and exasperated during the debate. WJZY’s choice of debate topics and their choice of discussion format was irresponsible considering the subjects involved. If the station couldn’t do better due diligence in finding debaters of equal standing, they should have changed the format of the discussion. Instead, the debate goes off the rails with Turek’s mistruths and snows Nami under an avalanche of rhetoric he (and, quite honestly, Crawford, as well) was duly unprepared to tackle. Turek cites incidents of heterosexual predators, “even sometimes involved in sexual assault,” in Los Angeles, Olympia, Wash., and Toronto, Canada. He says the proposed ordinance would open the doors to greater problems. The problem? Turek isn’t being completely truthful. First, the case in Olympia, Wash., does not in any shape, form or fashion include any suggestion or accusation of sexual predation. Second, where other cases exist — as in Los Angeles and Toronoto — the law has worked as it is supposed to. First, these cases are few and far between. Second, these cases aren’t about transgender people. They are about predators. Predators who are going to break the law and victimize others without needing prior “permission” to do so. The continual comparison between non-discrimination protections and a “license for sexual predation” reeks of prejudice just on its own. And, let’s just be honest here — Turek is playing a debate and rhetoric trick. He’s taking a much larger issue and reducing it to an oversimplified problem. It’s really just a logical fallacy, Argument by Generalization, making a broad conclusion from a small number of unrepresentative cases or examples. Trans blogger Autumn Sandeen addressed similar “bathroom bill” arguments and fallacies years ago. Taking Turek’s argument-by-generalization, anyone could come up with any sort of insane “solutions” to “problems.” For example, religious leaders and priests who are, by and large, straight men have been prone to commit a tremendous amount of sexual assault. To stop this, well, let’s just ban all straight men from ever being religious leaders again. Case solved. Unfortunately, that sounds ridiculous. Because it is ridiculous. We can’t solve social problems by creating even more social problems. We can’t solve sexual assault by discriminating in mass against straight men (its biggest perpetrators, in fact) and we can’t solve sexual assault by discriminating against a minority. These are straw men arguments that have nothing to do with the issue at hand — arbitrary discrimination in the public and places of business. Turek doesn’t understand the law. Here’s one of the best, simplest explainers I’ve seen on the topic of public accommodations.